"A tribute to children's public television pioneer Fred Rogers will include an effort to get people everywhere to wear a sweater on what would have been his 80th birthday. March 20th is being promoted as "Sweater Day" to honor Rogers, who died of cancer five years ago. 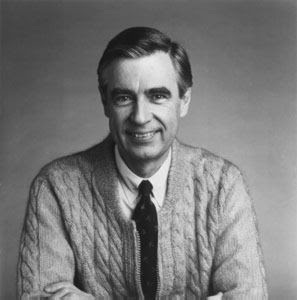 A sweater was his trademark garb on "Mister Rogers' Neighborhood." 'Sweater Day' is the capstone to a six-day celebration planned by Family Communications Inc. of Pittsburgh. Rogers created the company to produce his show. " It's all here. And I found the picture here. Thanks Molly! I think superman has a pair of swanky navy blue keds you could wear. "With an Arnold body and a Denzel face. . ."
So does Tilda Swinton, for that matter.